The Winter 2016 season is just about wrapped up! It’s time to look back at the Funimation series I said I’d follow and see if the series I picked to watch were enjoyable! Warning: May be minor spoilers ahead! 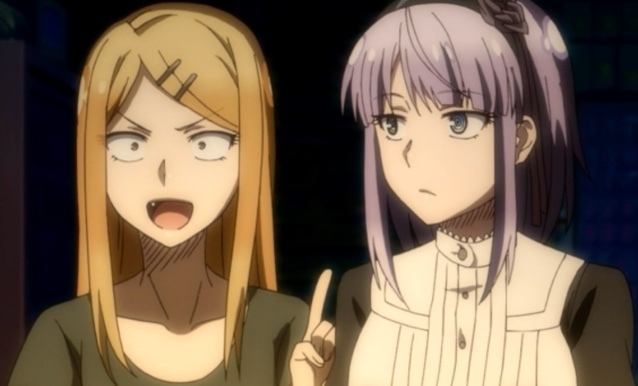 Hotaru and Master Saya during scary story time. Saya tried — and failed — to be brave. Capture from Funimation stream. Kokonotsu “Coconuts” Shikada wants to be a manga artist when he graduates high school. His father wants him to take over the family candy store. It’s not that Shikada hates candy and snacks. He’s quite knowledgeable, but it not his passion. He passes his days drawing and hanging out with his laid-back friend Endō Tō and sister Endō Saya. Together, they live in a quiet, out of the way community where nothing much happens. That is, until Shidare Hotaru arrives in town. Her family owns a huge candy and snack business, and they want Shikada’s father on board. He agrees, on one condition: Shikada takes over the family business when the time comes. And so the race is on to convince Shikada to get onboard with the plan. That’s about the most threatening this series gets. Once it sets up the scenario, the show gets to work being funny, shockingly informative, and harmless. Hotaru is a confectionary force of nature who has to try every kind of snack in infinite combinations. You might say she embraces the IDIC in candy form. At first, she seems to push Shikada to agree to becoming the shop owner. As time goes on, though, she settles on quizzing him about snacks and introducing him to new and sometimes scary combinations. Saya seems to have a crush on Shikada and for a while seems apprehensive of Hotaru (who calls her Master Saya for some adorable reason), but after it becomes clear all of Hotaru’s love focuses on snacks, Saya is able to relax. I could go on with some details, but I’ll just sum up the show in one word: comfortable. I wouldn’t mind hanging out with any of these folks. Add an enjoyable OP and an ED where Hotaru dresses as the Mad Hatter to Saya’s Alice, and this was easily my favorite comedy of the season. One surprise? The show went out of its way to show different kinds of candy and snacks, and far from being boring, I found myself absorbed. Entertained and educated? That’s a dangerous precedent to set! When they trance, Tsurugi and Athena are powerful, particularly in defense. Capture from the Funimation stream. A card game first, Luck & Logic debuted as an anime series in the Winter 2016 season. The show starts with Yoshichika Tsurugi, a former Logicalist, living as a civilian with his family. He had lost his ability to fight because he lost his logic card. In a brutal fight, he had engaged in something called “overtrance” that almost cost him his life and scattered his cards. The goddess Athena (also known as a foreigner), taking an interest in him because of his character and dedication, finds his card and restores it to him. Together, they can invoke a Logic Trance that enables them to fight even the most powerful foreigners who threaten earth and its citizens. Tsurugi and Athena aren’t alone in opposing foreigners who threaten Earth. Other human Logicalists and sympathetic foreigners fight with the two of them and for the organization called Another Logic Counter Agency (ALCA). As the series progresses, they come together as a team until a particularly powerful foreigner named Lucifer forms a pact with a lonely Logicalist, and the balance of power collapses. I’m at the point in my life where I’ve seen a lot of anime and a lot of science fiction. If you’re at that same stage, this anime might not appeal to you. It’s not that it’s poorly done or badly acted; it’s that I found nothing that leapt out and grabbed my attention. The heroes generally win; the villains have decent motivation, but they still seem to see themselves as villains; and I never did really understand Athena’s dedication to Tsurugi. The show had enjoyable moments, and the costume design was fun. When Tsurugi’s teammates (all women) tranced with their foreigner partners, they appeared as magical girls, and the costumes and personalities were colorful and enjoyable to watch. I think my favorite human character was Veronica Ananko and her foreigner Nemesis. I identified with Veronica as she tried to be a respectable leader who fought for her people. I also thought Nemesis was a good example of a foreigner’s non-human perspective on the conflict between humans and hostile foreigners. Yet, at the end of the day, it didn’t cut new ground for me to the extent that Grimgar of Fantasy and Ash did (see below). Do I recommend it? Sure! But will it change your life or help you see the world in a different way? I don’t think so. And that’s not a condemnation! So please, enjoy! I suspect Mira might have planned to use the sharp implement on her tail to get some payback for all the times Mabuchi mistreated her — though Mira would never stoop to something like that. Capture from the Funimation stream. In a world where most power comes from coils connected to a limitless energy source/universe called Dimension W, Kyōma Mabuchi is an ex-solider hiding a painful past who collects illegal coils. On one mission, he encounters an artificial person named Mira Yurizaki, whose “father” was the chief scientist who perfected Dimension W as a power source. He thinks she was trying to trick him into thinking she was human, so he restrains her — just in time to see her father perish in a column of green light. They begin a journey to unravel the mystery of the coils and their impact on Mabuchi’s life. Here’s the short version of this series: Started great. Declined rapidly. Ended in bafflement. 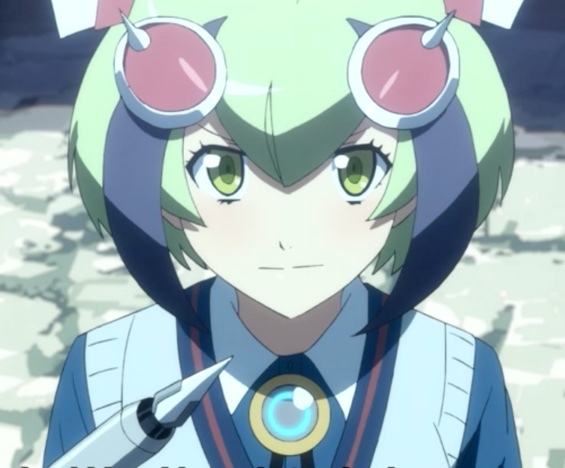 There’re few things I dislike more than wasted potential; I’ve rarely seem more potential wasted than in Dimension W. I hate to say that, but if one plus one is two, I’d be lying if I said it were three. This isn’t to say the show was a complete disaster. Mira was consistently delightful, and Mabuchi, despite his brutish ways, had a wounded “strong man” appeal. Some of the secondary characters like Mary, Albert Schumann, and Claire Skyheart had a ton of potential. But for me, the series never came together. This was the Funimation series that I reviewed for the Winter 2016 season. You can read my episode reviews starting here. I’m not saying Clarion had no appeal. I am saying BUER is the stuff of nightmares. Capture from the Funimation stream. Nene Nanakorobi, a human young woman with a cyborg body, is on a cruise ship that’s heading for an island on which her aunt lives. While on the ship, she befriends a scientist named Uzal Delilah and her artificial assistant named Clarion. By the end of the first episodes, Uzal’s staff on the island, who are inexplicably dressed in various costumes like bunny girls, rebel against her because of disrespectful treatment, and they accidentally almost destroy the island. Nanakorobi has the ability to absorb transient skills, and since she trusts Uzal, she fights along side Clarion to further Uzal’s goals. The island’s saved, and the costumed girls are captured by the authorities. I think that’s as sane as the show gets. Nanakorobi develops a crush on the artificial Clarion, who can link to Nanakorobi via ports in a hidden access point revealed when she lifts her skirt. Since Clarion appears seriously underaged, this felt disturbing to me. When combined to the bizarre way Uzal’s staff dressed, I have to admit that I didn’t last two episodes. And don’t even get me started on BUER! * This is one of the Winter 2016 series that I couldn’t finish. I’m not saying this is a bad series. I’m saying I didn’t like it. Your mileage may vary (YMMV). This series starts in a way that’s similar to many displaced world stories: characters wake up on a new world, unable to remember where they came from, and have to adjust. Generally, stories like Sword Art Online follow the most powerful characters who go on to shake the world with their deeds. Grimgar follows the weaker characters who couldn’t hack it on the front lines. Despite that, they were determined to survive and eek out a living where they could buy luxuries like new underwear or adequate weaponry. The story follows several characters, like Haruhiro, who trains as a thief (in the sense of Bilbo Baggins from The Hobbit). Leadership of their small band falls to him, and he struggles — hard — to live up to his own expectations. Yume somehow maintains a quiet detachment that comes across as absent mindedness, but that actually stabilizes the group so they don’t fall into despair. She’s adept with a bow and is generally fearless, even in the face of enemies. 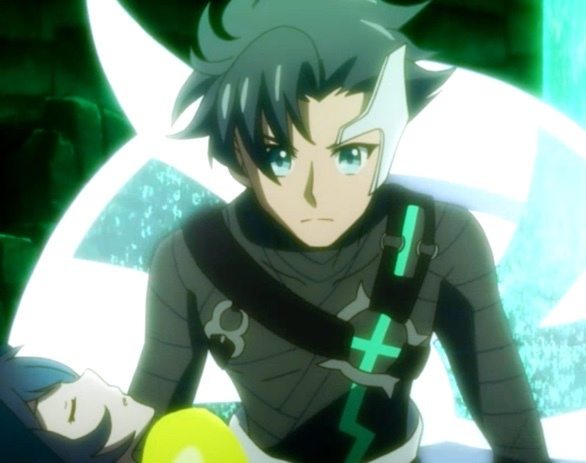 Ranta, a hot-head who embraced the Dark Knight guild, comes close to driving team apart, yet, by his very carelessness, fulfills a role similar to Yume’s in that he’s a shield against despair. Moguzo, a very large and quiet man, enjoys cooking for all of them. 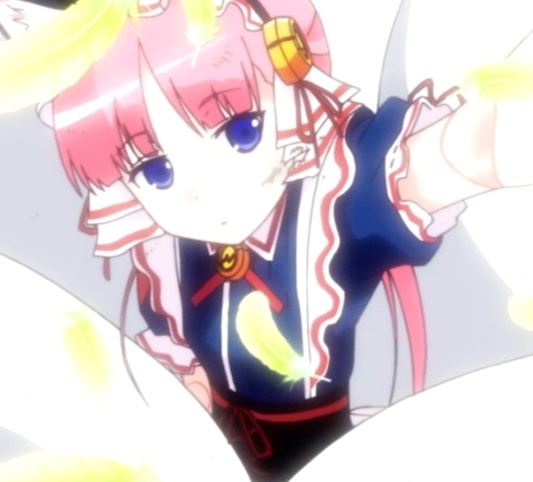 He’s their front-line offense and defense.Shihoru is quiet and timid, and she decides to become the group’s wizard. Of all of them, this new world seems to terrify her the most. It took some time, but with the help of the team — especially Yume — she embraced her role and put aside her fear to fight for them all. In many ways, Yume’s quiet optimism kept the group afloat. Capture from the Funimation stream. When I started watching this show, I expected a standard “heroes get transported from our world to another and have to do stuff to survive.” It’s a fun theme, if done right, and if a series doesn’t turn out to be earth-shattering, it can at least be entertaining. Grimgar, though, gets the award exceeding my expectations by the highest margin this season. First, the show is visually beautiful. There were many times I felt as if I were watching an artist’s water color come to life. The backgrounds consistently demonstrated this quality. The characters interacted smoothly with this environment, and they moved through the light and shadows as if this were live action. That in and of itself would be noteworthy. Not content with being visually captivating, not happy with simply showing us the less strong of the teams, Grimgar decided to do something amazing. Instead of glorifying combat and the way of the warrior, Grimgar stayed true to its nature: it showed a team on the trailing edge, struggling to survive and thrive in a strange environment. Just as they almost hit stride, their leader fell, killed in combat. And the team almost shattered. 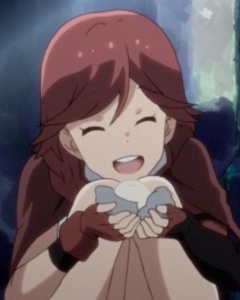 Grimgar spent several episodes dramatizing how the individual characters split and reformed as they tried to deal with the loss and their roles in it. Of all the Funimation shows in the Winter 2016 season, if you only have time for one, watch Grimgar of Fantasy and Ash. It’s a real gem.